Numerous sites and TV shows have taken the burger to extremes with super fusion gourmet burger recipes. 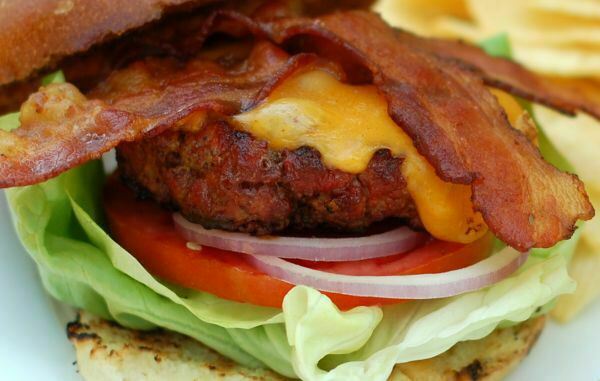 But for me the quest for the best burger recipe ends with a simple bacon cheeseburger. I really don't need a Thai-Spanish bleu cheese burger. There is something to be said for the classics. I tried using ground bison for this recipe, but good ground chuck works just as well. Bison has a bit more flavor and is naturally leaner, 90/10 in this case which indicates 10% fat. You can get beef in the same ratio, but if going with beef, I would recommend 80/20 for juicier, more flavorful burgers. 1With such lean meat, I like to add a bit of "good" fat back into the burger. This helps keep the meat moister and adds a bit of flavor. It isn't required, but I think it helps. If you are using oil, crumble the ground meat into a large bowl. Drizzle the oil and add the salt and pepper. The ground bison I used was very compressed when I got it, so I took some time to break it apart with a pair of forks before adding the oil, salt and pepper. Gently mix this into the meat, taking care not to overwork the meat. 2Now gently form four even balls of meat. Again, try not to over work or over compress the meat. Push into a patty. Add a dimple in the middle (see picture below) to allow for the expansion in the middle that happens when the burger cooks. This will keep a flat patty that won't roll off your bun. 4Let the patties come up to room temp, about a 1/2 hour out of the refrigerator before grilling. 5Cook your bacon while the patties come up to temperature. 6Once the bacon is done remove the skillet and make room for the burgers. 7We cook these on high, direct open flame. Place the burger on the hottest part of the grill. Contrary to popular opinion, searing does not keep in the juices, but adds lots of good flavor to the burger. 8Start your timer, and wait for 4 to 5 minutes. If you get flare ups, move the burger from the flaring area. No need to use water, just move to a warm zone, away from the flame until the flame dies down. 9Flip your burger and cook for another 3 to 4 minutes for medium-ish. All of this depends on the temp of your grill, of course. If you are going to add cheese (you must! ), add it a minute before the end of the cooking time. 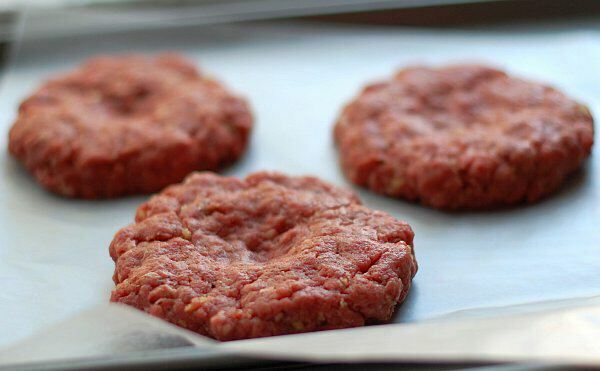 10Remove the burgers from the grill and let them sit for about 5 minutes while you toast a few buns on the grill. 11Assemble with bacon, bun and condiments for a tower of deliciousness. Enjoy! Don't forget the french fries. I’ve always liked mine with thousand island dressing….